Product prices and availability are accurate as of 2019-04-21 00:31:33 CDT and are subject to change. Any price and availability information displayed on http://www.amazon.com/ at the time of purchase will apply to the purchase of this product. Rated to ballistic impact standards, the Smith Pivlock Echo Max Elite Sunglasses protect your eyes from airborne objects hurtling at high speeds. Smith's Free Float lens technology satisfies both ANSI Z87. 1 and MIL-PRF-31031 standards, meaning it's guaranteed to protect your eyes when high-velocity objects are a very real hazard. Going one step further to accommodate tactical personnel, thin Echo Temples mold to your head without creating an uncomfortable pressure point under a helmet or protective ear pads. 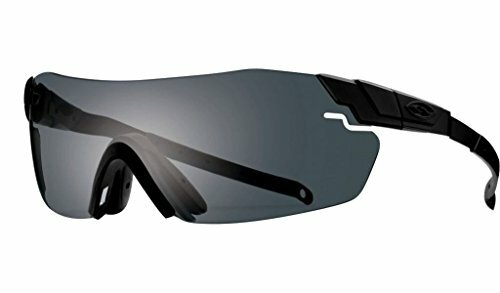 Although catered to tactical military units, the Pivlock Echo Max Elite Sunglasses make an excellent choice for outdoor athletes seeking maximum protection from blinding light and eye-irritating debris. The oversized lens offers an uncompromising field of view while the infinitely adjustable nose pads secure the sunglasses at high speeds. Its anti-fog lens coating keeps your vision unobstructed when you're pouring sweat. Additionally, the lens offers 100% UV protection on bright, sunny days. Proposition 65 Warning for California Consumers: This product contains chemicals known to the State of California to cause cancer and/or birth defects or other reproductive harm.